Retractable cable saves your space and trouble. It can retract into the housing and be stowed in purse wallet and other travel bags. 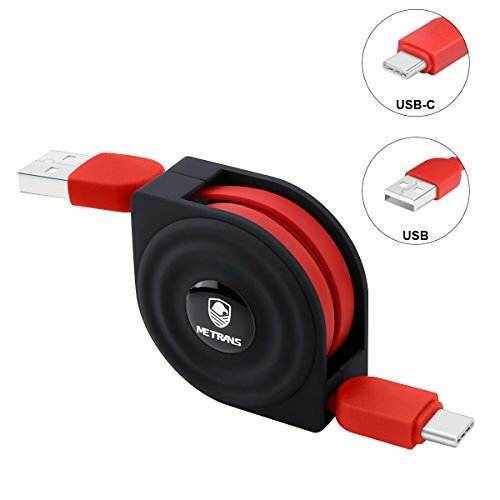 Support USB type c device to fast charging and data syncing at the same time, provide a safty and fast charging at 2.1A current maximum and data sync speed up to 480Mbps. Super fast charging time and speed transmission (up to max 5Gbps) ,transfer an HD movie in under 5 seconds.USB 3.0, conforming to the USB Type C Specification version 1.1, 56kilohm, standard identification.No damage to your legacy USB hub. Compatible with all USB C devices,Samsung Galaxy S8 Plus, LG G6 G5,LG V20,Apple New Macbook, OnePlus 2, Google Nexus 5X, Nexus 6P, Google Pixcel, New Nokia N1 tablet, Lumia 950, Lumia 950XL, ChromeBook Google Pixel, Asus Zen AiO, Lenovo Zuk Z1, HP Pavilion X2, ASUS ZenPad S 8.0,Huawei P9,Huawei Mate 9 and More.